MILWAUKEE – (Jan. 22, 2018) – Johnson Controls GLAS smart thermostat has been named a 2018 AHR Expo Innovation Award Finalist in the Indoor Air Quality category. The annual Air-Conditioning, Heating and Refrigerating (AHR) awards honor the most inventive and original HVACR products, systems and technologies that are showcased at each year’s AHR Expo. Products are evaluated by a panel of third-party, ASHRAE-member judges who assess entries based on innovative design, creativity, application, value and market impact. Launching in early 2018, GLAS is the first smart thermostat of its kind to utilize a translucent OLED touchscreen display to control its functions. Users simply touch the screen to change the temperature, monitor indoor and outdoor air quality, track energy savings or perform other functions. Alternately, GLAS can be controlled by mobile app or by voice, thanks to Microsoft’s voice-enabled digital assistant, Cortana. When it’s not in use, the screen seamlessly blends in with a building’s environment. GLAS can be installed in select commercial applications as well as residential settings. Johnson Controls understands that contractors, engineers, facility managers and others involved in commercial HVAC specifications have exacting standards for their buildings, which is why it has been proud to meet or exceed those standards for over a century. As such, GLAS has been designed to adapt to a wide range of installations. GLAS is designed to create a consistently comfortable space and does so by leveraging Johnson Controls’ deep experience in automation and proprietary temperature control algorithms. GLAS provides around-the-clock reporting of equipment run-time as well as a related seven-day trailing report of a user’s energy savings. GLAS also provides seven-day scheduling that can be customized according to user preferences. Comfort settings include pre-start heating/cooling and fan and ventilation options based on temperature and air quality. GLAS tracks and assesses multiple aspects of air quality to ensure that occupants are consistently comfortable, knowing that a healthy space starts with the air its occupants breathe. In addition to temperature, GLAS reports humidity, total volatile organic compounds (tVOC) and equivalent carbon dioxide (eCO2) inside a building or home. When it is internet-connected, GLAS also monitors tree, grass and ragweed pollen count; ultraviolet (UV) index; and air quality index (AQI)—including carbon monoxide, sulfur dioxide, nitrogen dioxide and ozone levels. When air quality falls below moderate levels, GLAS can intelligently operate a fan or ventilation equipment. These insights arm allergy and asthma sufferers with information they need to live more comfortably. GLAS adapts to a user’s schedule to intuitively and attentively maintain a comfortable space while it saves energy. Its automation programming is easy to understand and takes the hassle out of setting individual preferences. After a user sets preferred temperatures for Home and Away modes, GLAS’ smart logic helps save energy by detecting when a space is occupied or empty, and automatically adjusts its settings accordingly. With Cortana, Microsoft’s personal digital assistant, users can easily adjust, refine and redefine their space with simple voice control. Cortana allows users to check and audibly receive indoor and outdoor temperatures, set increases or decreases in thermostat temperature and obtain the current weather forecast by using their voice, among other skills. Additionally, GLAS provides an intuitive, engaging experience whether interacting with the device itself or the GLAS app on mobile, tablet or web browser. Using mobile apps for iOS and Android operating systems, users can seamlessly access GLAS controls and statistics with the same interface from the device, eliminating any learning curve. 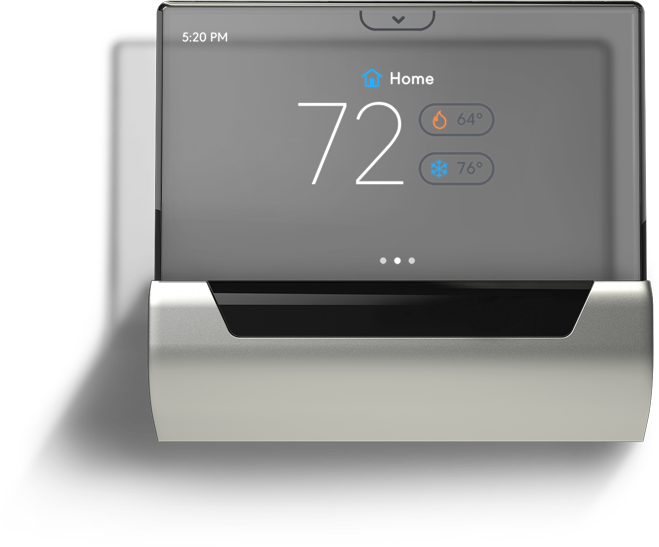 GLAS is available for pre-order in March 2018 at glas.johnsoncontrols.com and has a manufacturer’s suggested retail price of $319. For more information, visit glas.johnsoncontrols.com. The AHR Expo (International Air-Conditioning, Heating, Refrigerating Exposition) is the world’s largest HVACR event, drawing more than 2,000 exhibitors and over 65,000 attendees from 165 countries worldwide. It will take place Jan. 22 to 24, 2018, at McCormick Place in Chicago. The AHR Expo is co-sponsored by ASHRAE (American Society of Heating, Refrigerating and Air-Conditioning Engineers, Inc.) and AHRI (Air-Conditioning, Heating and Refrigeration Institute). To download high-resolution images and video assets, please visit glas.johnsoncontrols.com/press/.